Tipper Erik202 sent in a tip the other day and included the suggestion that DT does an "Italian" week special...and I thought to myself, this is a great idea, but I need to make sure that my team of editors agreed to this suggestion. So, I turned to the teddy bear on my left and the bottle of Jim Beam on my right and then realized that I didn't need their permission to do an Italian week and I'm pretty sure the teddy bear is trying to horn in on my gal. I might have to loosen his lips with a few pints of JB before he admits it, but I've got nothing but time...because, after all, it is Italian week. 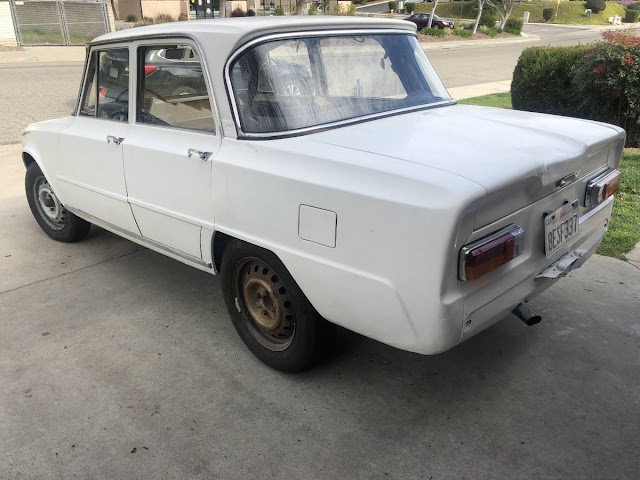 Find this 1967 Alfa Romeo Giulia Super Berlina offered for $8000 in Escondido, CA via craigslist. Tip from Erik202. This is a runner/driver/bomber type car. The brakes need some fiddling around however. I just had Power Brake Exchange restore the booster and master, though its still being finnicky. This has a Spica injected 2L. 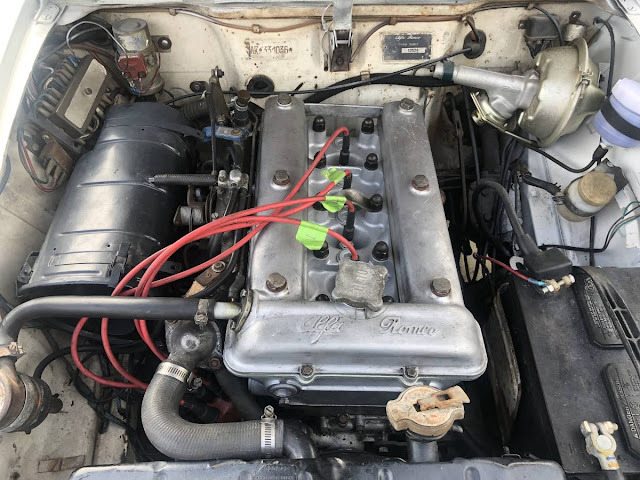 I also just had the head worked on, as the spark plug holes were stripped. The head has new valve seals, is faced and has time sert spark plug holes, never to be stripped again. I painted it just to make it one solid color. The paint job is pretty BAD and the body work (whoever did it before me) isn't great either! If you want a perfect Super this is NOT your car. I have the front and rear bumpers. My asking price of $8,000 is for the car alone. For $10,000, you'll get another 2L, partially assembled, another 5 speed trans and a HUGE pile of spare parts for this car that will go with the higher asking. Spare doors, hood, trunk lid, seats, instrument cluster. More than you can imagine. Priority will go to those who will take the whole lot, as I'd like to have more room around my house. I have another Super being restored that is demanding large payments at the moment, which is forcing the sale of this. Let me know if you have any questions or would like additional pictures. Clean title in my name in hand. Yes! Here that that boxy Italian I was talking about yesterday! It would be very tempting to "supersize" this deal to include the spares package that the seller describes. Plus it would turn the trip into a logistic puzzle. What fun! This is an $8K car?! Yeesh. I guess I just don't have the stomach for one of these if this is the entry level. I had not checked the rest of the photos on the CL ad. Yikes, I agree, this car has some serious needs. I wonder if the sale includes the family of raccoons that apparently has been living in it?